The 18 is Ultimate Direction’s middleweight skimo vest, with more storage space than the ultra-minimalist 8, yet slimmer than the bubba 28. It might be called the default option for those used to skimo race packs. Competing feature-for-feature, the Skimo 18 can carry everything you need for basic day tours and most races. It is also “vest-style”, which is the specialty of Ultimate Direction, a leader in trail-running equipment. That means more storage up front for your hydration and energy needs. But it will also carry your skis and stash your crampons from the side. The UD Skimo 18 is lightweight workhorse for daily touring and racing. Surprisingly durable 100D rip-stop nylon is also light and breathable. Multiple ski-carry options with a quick-hook AND a wrap-around included. Side-access crampon pocket also great for extra layers, hydration, or pizza. Crampon pocket is gusseted so the Velcro gets a perfect seal every time. Partner-tow attachment has a storage locker for tucking it away. Front pockets hold hydration flasks, gels, and even a bit more. So is the consensus that this pack is not going to fit larger shovels and probes? Interested in a pack like this, but don't really want to buy a new shovel and probe given that I probably won't race that often. Currently have a BCA 270cm probe and B-1 shovel. I have an Ultimate Direction running vest in size S/M...sounds like S/M in this is a bit small for big shovels/probes. Toddball- Your shovel will fit in the pack, we tested a similar size shovel but the probe is a little long. All of this was tested on the size small. I love this pack, it has quietly taken over my every-day BC back slot. I have a Mammut alugator light shovel and a 240cm Arva compact probe, both of which fit just fine. I usually also toss in a down puffy, backup gloves/mitts/hat (in the AMAZINGLY useful crampon pocket) and some extra water beyond what's on the chest. The ski carry system works great, the soft water bottles on the chest + pockets for snacks and stuff are great, and the crampon pocket is really spectacular (though I haven't been keeping crampons in there for the most part), so nice being able to reach back and grab either warmer mitts, hat, goggles, etc without taking the pack off. The buckles are a little finicky, minor gripe. Also, the ski carries can be removed (I leave 1 off almost permanently and remove the other in the summer) and the pack doubles as an awesome trail running / hiking / biking pack. It's a 4-season pack for me, which is a lot better than I expected from it. Thanks for this review. Is there an easy way to attach poles to this pack when you use it for trail running? Five Stars, although with One Big Caveat: I haven't used it, and I don't even own it. - Holder on left shoulder strap for a bike-style water bottle is built-in, and far more unobtrusive than the relatively bulky Dynafit or CAMP versions. - Emergency whistle is cleverly tucked away inside that same bottle holder, so easily accessible should you ever need it, and out of the way otherwise. - Elastic pouch below that for water/gel flask or gel/bar packets. - Both lasso- and hook-style ski attachments. - Elastic pouch on right shoulder strap for a water/gel flask or gel/bar packets. - Both the sternum and waist straps can be easily repositioned or removed entirely. - Clever little sewn flap on bottom of pack with adjustable bungee for additional external attachment point (e.g., bulky puffy), or perhaps for a partner tow, although that would have to be tested in the field. - Main compartment has pass-through to bottom compartment to accommodate a probe or shovel shaft. - Bottom compartment side closure is the usual velcro, but (and this strikes me as incredible brilliant) incorporates an accordion-style flap so it will flip closed if you inadvertently leave it open (yet still stays open when you actually want it to be open). Hey mbillie1, thanks for reaching out. The pack will definitely fit a Response-X. I tried a 185cm Session-X (116mm tail) and it fit with room to spare. I also tried the Movement Alp Tracks 106 that has a 126mm tail and it fit fine, but it's approaching the comfortable limit of what the pack is capable of. I've been using this pack as a spare while my Millet pack is being repaired after stitching blew out. I'm a 38" chest and using the M/L. I feel like I'm right in between sizes as the S/M fits best across the chest, but is difficult to reach into the safety box while the M/L is a little loose on me unless I use one of the waist/sternum buckles. Obviously using a suit or race-inspired top that is loaded up makes things fit a bit better. As a race pack you're well able to get all of your required gear in the pack assuming you're using race-category gear. An Arva Carbon Compact 2.40 probe and Ultra shovel fit easily in the M/L with enough room for a pair of Mezallama pants and jacket with room to spare. Additionally there is a small sleeve for a smaller hydration bladder and a mesh zippered pocket for small essentials. Down below in the safety box, you'd easily be able to fit a pair of race/lightweight touring crampons with room to spare for gloves or skins. A beefier pair of technical crampons will also easily fit, likely with some spare room. The ski carry system works well with a caveat (see below) and the horizontal orientation of the bottom ring makes it easy to thread tails when breathing hard and mentally frazzled. I may have preferred a wider or stiffer piece of material for the loop but that is just my preference. The exterior bottom of the pack has a bungee loop stitched into a square of fabric that creates an open pocket and a small loop sewn in towards the body that is ostensibly for a partner tow (no tow cord is supplied with the pack). In the "I'm not sure what purpose this serves" department the function of the former fabric pocket and bungee loop escapes me. Please feel free to clarify and mock my cluelessness if the purpose is obvious. Finally, partner ski carry, basic single axe carry point, and an external port on the shoulder for hydration bladder use round out the packs features. 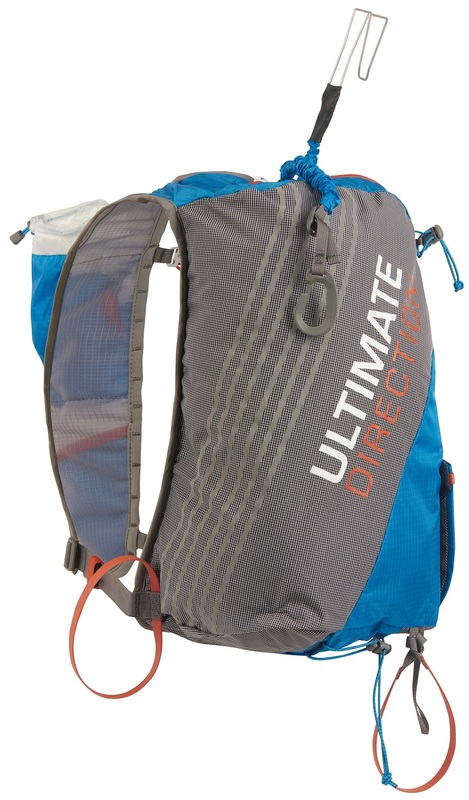 The pack's strengths come from Ultimate Direction's pedigree as a functional vest designer. Using soft flasks, this pack makes hydration and eating a breeze when temperatures allow for flasks to be outside of the suit. The often wasted real estate of your shoulder straps is jam-packed with functional space on this vest/pack (and also a safety whistle to meet ISMF requirements). Aforementioned adequate space inside let's you carry what you need for a day without too much hassle. On the downsides there are a couple of issues that are just straight-up perplexing given the attention to detail on the other aspects of the pack. I'd love for someone to point out where I'm just misinformed or clueless if any of these points are off-base. The bungee hook for the ski carry system seems to be unnecessarily long to the point where the skis disconcertingly flop around. This is easy to resolve by just tying a knot in the bungee cord which reduces the available length (and therefore increases tension) and provides a more secure carry. The axe/tool carry loop on the bottom is also oddly long and leaves an axe flopping around on the outside of the pack. Maybe this is to facilitate stowing two tools/axes? However if only carrying one, an overhand knot in the loop at the base of the stitching reduces the length of the loop and reduces the amount of flopping to a more reasonable level. My personal gripe is that the sternum/waist buckles have small magnets in them in an attempt to make it easy to close the buckles with gloves on. I don't find this to really provide much help and I haven't found snapping a buckle with gloves on to be overly difficult on other packs. The real problem here though is that magnets emit electro-magnetic fields. Electro-magnetic emissions potentially can cause interference with avy beacons. Given that even headlamps have been reported to affect beacon transceiver functions, I find it hard to believe that these magnets would not also potentially cause interference (http://www.mammutavalanchesafety.com/2014/10/electrical-interference.html). I've communicated this concern to UD and hopefully they will get an definitive answer, but for the time being if using a beacon with this pack it may be caveat emptor. So overall great design and very functional for racing, but a point off for a couple of odd design choices that leave at least me scratching my head. I believe the little pocket by the tow strap attachment is to store the tow strap when not in use. 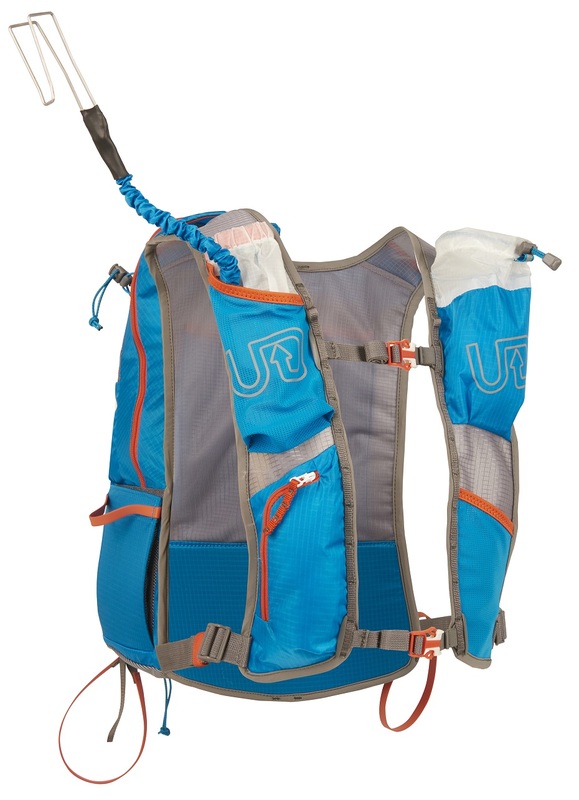 In terms of next-level vest style skimo packs, the UD Skimo 18 is a clear winner. UD knows what they are doing when it comes to functional vest-style pockets for nutrition and hydration. The ski-carry is dead simple and easy to use and while not as easy to use as the Dynafit style, the crampon garage is easy enough for extra emergency skins, clothes or even crampons. I really want to love this thing and give it 5 stars but what is really killing me is that I cannot for the life of me fit a shovel in it. And I am talking about an Arva Plume, not a full blown Voile Telepro. Even my Dynafit RC18 holds any shovel I want to carry. So with that "feature" it appears that this pack will be relegated to non-race resort laps. Upon second glance, the UD site states in the fine print: "Main Pocket, will hold race shovels typically sized 22x 29 cm and probes under 47cm length when folded" - there are not many shovels that fit that description (luckily you can find most of them on this site!) so just be aware when you are thinking about a pack that can do it all (which this thing "almost" can!). Note - this limitation also appears to apply to the larger Skimo 28. I really don't want to own something like a Camp Crest just for racing but I may have to. Hi Aaron, here is a photo of an ARVA Plume in the UD 18. It fits pretty easily. Are you sliding the handle down the slot on the side? I clearly was missing something - this does indeed fit! Thanks Jason! I revise to 4 stars! Quick update - the photo I posted was using the M/L size. Turns out the Plume shovel actually doesn't quite fit in the S/M size! It does, it is just a bit tighter than pictured (the handle T goes a bit higher into the top of the shoulder strap). Not ideal and not super comfortable but fine in a pinch - I think an easy fix from UD would be to just upon up the area between the crampon garage and the back panel similar to the Dynafit packs. If you have any input with them, make the suggestion? But so far this season, I am very happy with the pack.